In the rapidly progressing solar and renewable energy landscape in Sri Lanka, JLanka Technologies – the foremost solar solutions provider of the country – has taken a leading role in promoting economical and ethical business practices to ensure the steady and sustained growth of the local renewable energy industry. Providing solutions across all areas of domestic, industrial and utility scale solar systems to an impressive portfolio of over 3,200 clients, the company has been heavily invested in sharing their accumulated knowledge across all stakeholder groups, a highly commendable effort that resulted in solar technology recently being endorsed by the Tertiary and Vocational Education Commission (TVEC) as part of the vocational and general educational curriculum in Sri Lanka. This feat comes in the wake of the establishment of JLanka’s very own Academy of Engineering and Green Technologies, the company’s direct investment in their vision for knowledge dissemination among the next generation of green energy enthusiasts. Referred to as the country’s first ever ‘Green Academy’ and the first solar educational establishment, the overarching objective of founding the institution was to nurture a passionate, highly competent and adaptive solar energy workforce to meet the rapidly increasing demand for solar solutions in Sri Lanka. The Green Academy focuses on educating, engaging and empowering school leavers through a three-pronged approach; starting off with a three-month training and theory course, all participants will next be placed in real-life industrial environments to gain industry experience as well as an income. Finally, upon the successful completion of both the theory and field-placement, the participants will receive an internationally accepted certification endorsed by the TVEC with a guaranteed job placement through JLanka Technologies. In order to bridge this skill gap, the JLanka team led by Marambage spoke to the TVEC – the apex body in technical and vocational training in Sri Lanka, as well as the National Apprentice and Industrial Training Authority (NAITA), the state body providing industry acceptable technical and vocational training in the country. JLanka was encouraged by both establishments to expedite the development of an internationally benchmarked solar technology educational framework. “Solar is an energy source that Sri Lanka adapted slightly late to,” Marambage continued. “But now through JLanka’s highly economical and strategic investments, it is a technology that is easily accessible to a majority of Sri Lankans islandwide. 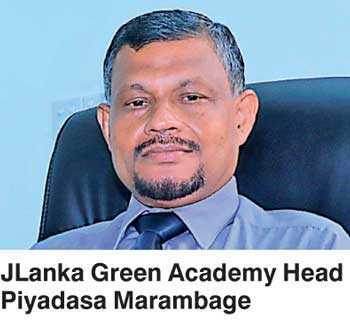 The initial proposal for the Green Academy was accepted by the former Ministry of Skills Development and Vocational Training in 2017, with JLanka giving a structured overview of a curriculum, teaching, assessments, examinations and competency measurement for the proposed certification, created in collaboration with leading solar experts and educational consultants in Sri Lanka. This was followed by the Green Academy’s registration and endorsement by the TVEC. The first batch of students have thus far successfully completed the first three months of theory and training, and are currently on-field at their respective industrial placements. The completion of the six-month training will earn them a level 3 National Vocational Qualification (NVQ). The intellectual property of the curriculum was then shared among other state vocational training institutions such as the Vocational Training Authority of Sri Lanka (VTA), the Department of Technical Education and Training, National Apprentice and Industrial Training Authority (NAITA), the University of Vocational Technology (UNIVOTEC) to be included in their own syllabi as an integrated component that would complement other areas of expertise such as construction engineering, mechanical engineering, electrical and electronic streams. UNIVOTEC was also presented with two solar systems free of charge by JLanka for educational and research purposes. Both UNIVOTEC and the University of Sri Jayewardenepura committed to the cause further by signing MoUs with JLanka to continue with the solar curriculum in their institutes to setup renewable energy laboratories. With the success experienced in the vocational educational vertical, JLanka moved towards the general education vertical, with recent legislations making it compulsory for students to complete 13 years of schooling and to remain in school till the age of 18. This provided the company with an opportunity to incorporate solar to the Advanced Level Vocational Stream recently introduced by the Ministry of Education, that has already been introduced to 42 schools across the island as a pilot program, a number that will be increased to 150 schools by next term. With the next revision of the Technical Stream curriculum, JLanka is looking to add solar technology as a singular component as well as integrated components to the syllabus.